You may have read my previous article for Eat Sleep Drink Football which was a corner analysis of Maritimo, it got me thinking about other clubs who may exploit the slight edge that I believe is to be found in set-pieces, so decided to turn it into a mini series where I’ll explore how these teams are potentially finding an edge and benefitting from it, or whether they’re succeeding through pure luck. I had a hot-tip from someone on Twitter that Greenock Morton in the Scottish Championship had an unusually high rate of scoring from set-pieces so I decided to investigate. As of the time of writing Morton have taken 153 corners in the league this season, giving them an average strike-rate of 3.9% from corners – that falls inline with the accepted average of 3% that I mentioned in my previous article, so I’ll mostly focus on their very high success rate from free-kicks, however Morton do seemingly (despite reading an article saying that they don’t practise set-pieces) have a few nice corner routines that I’ll be expanding on later on in the article. Here we see the goalscorer (marked in yellow) past the last lines of the Falkirk defence. So far, nothing special with poor defending being the main factor here. We see here Morton in yellow whilst Raith Rovers are playing in black and this time it’s an interestingly worked free kick. Rather than running in a straight line towards the goal the players break off into different directions to try to confuse their marker whilst another pinpoint delivery from Forbes lands on the head of Lee Kilday – again however the defending is slightly suspect with none of the defenders being aptly positioned to stop any sort of header. Another interesting free kick, both defensively and offensively. Defensively Falkirk are in my opinion set-up relatively well. They have a 2 man wall and a player on the near post to ensure Forbes delivery cannot pose an instant threat. Alongside that they have a solid looking man-marking system in front of the keeper that would make it hard for a Morton player to get a convincing header off on goal. Morton have a plan though which entirely confuses the Falkirk defence for a vital second. The player labelled as 7 turns his marker and makes a run for the back post – where I believe the cross was intended for. The three Morton players near the back post try to confuse their markers by swapping places and generally being a pain to try to mark before the ball lands on the head of O’Ware leaving the keeper helpless. Another free kick from the right hand side of the pitch in a near identical position to that free kick against Raith. St Mirren line themselves up relatively well considering the threat that the Morton attack looks to pose, and that’s the key point regarding this free kick that I believe is pretty intelligent from the Morton perspective – the positioning of their players. The Morton players are set-up in a quite unorthodox shape, giving the false pretense that they’re about to potentially try something intricate, which in turn draws 6 St Mirren players out of the game, leaving a 3 vs 3 on the edge where the ball is again whipped in onto the edge of the 6 yard area for O’Ware to once again head home. This is a tactic that I think is again under-rated when it comes to set-pieces – the art of deception, giving the illusion that you’re going to do something unexpected, then doing the expected. For this free kick Morton go for the unexpected route, by committing hardly any men forward for the kick. The kick taker (marked number 8) delays the kick until the player marked number 7 back peddles away from his marker to the edge of the box. His marker decides to stay in zone rather than tracking the man, which proves to be a bad decision as Gary Oliver receives the ball and curls home. An interesting routine, despite the poor defending and me initially thinking Oliver had done too much and should have released the ball earlier (potentially for someone else to have a shot), it results in a goal and ends up being relatively well worked. As with some of the above free kicks, Morton rely on confusion and panic to get the goal here with the constant moving and hustling of the 4 players near the 6 yard box leaving the Dundee defenders so helpless they end up putting it in the back of their own net. The player labelled as number 1 on the blueprint makes a run to the back-post after previously being unmarked causing a slight overload in that particular area further adding to the confusion. A very poor defensive set-up from St Mirren here leads to the goal. There are 3 key players who, if their positioning was correct would’ve had a much better chance at defending the free kick. The players labelled as 1,2 and 3 on the blueprint are those players and they are doing nothing to contribute defensively being in those positions. 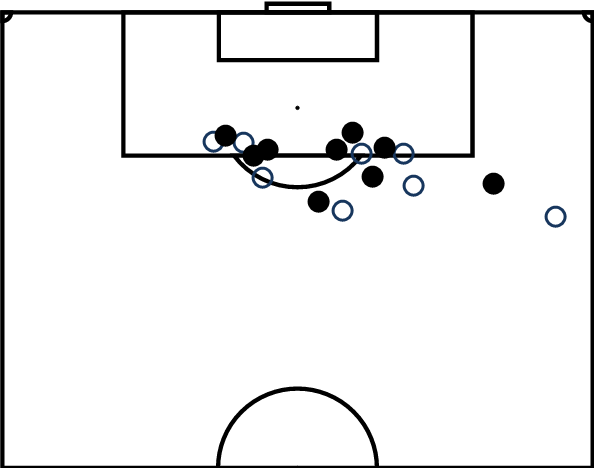 Player 1 is there as a one man wall which is frankly not needed from a free kick at that range and it’d have to be a very poor delivery to hit the wall, with the rest of the St Mirren players not in a position for a counter attack even if it does, making the point null. Instead I believe player 1 should be shifted slightly more central closer to the other Morton player closest to the kick taker. This cuts out the option of a short pass, whilst also being closer to the action and would actually serve a purpose. Player 2 is next up and is presumably tasked with making sure that the ball isn’t played short to the Morton player described above. The relocation of Player 1 will allow Player 2 to be moved into an area where he’ll be more useful, such as the area to the left of the D, where you can now create a defensive overload. Player 3 is also in no-man’s land in his current position, he’s not marking anybody, he makes no attempt to run into the box, nor looks at any of the Morton players, essentially playing the role of a mannequin on the training ground. Much like above, if his position was moved more centrally another defensive overload would be created which is actually where the goal came from as well! As well as a huge amount of headed goals from free-kicks, Morton also had a few other nice routines I’d like to draw attention to. The first is a free kick against Ayr on the 10th September 2016. There’s a couple of clever moves here, starting with Morton player in the wall who edges across making sure that the keepers view is obstructed, he moves just as the number 10 dummies his run up making the keeper shift just a inch to his right, which allows Forbes to bang it home into the top corner, the keeper still manages to get a hand to it but the damage is already done. Next are 2 nicely worked corner routines both in the same game (in which they conceded from a Morton free kick covered above!) against Queen Of The South. I won’t go into too much depth here as it’s not really needed, both are fantastically worked and ridiculously hard to defend against, whilst also being relatively easy to pull off from an attacking sense and i’m not sure why more teams don’t practise set-piece routines like this as they can be highly effective. So are Morton doing anything special? Do I believe their claim that they don’t practise set-pieces? How do teams counter their threat? I believe they aren’t doing anything fantastically different to many other teams, but i’d be staggered if they don’t put in extra practise on set-pieces as many of those routines simply wouldn’t work if every player didn’t know precisely what they were doing. Bad defending or lack of preparation from their opponents also is a factor – one thing I noticed was a few of the opponents appeared twice in the free kick analysis however an edge is an edge, no matter the opponent. The last key factor is the delivery Morton have, Ross Forbes seems to have a wand of a left-foot and is the league leader for assists this season and I wouldn’t be surprised to see a few Scottish Premiership sides eager to snap him up should Morton fail in their promotion attempt. As for defending against the dangerous Morton free kicks, simply being aware of the threat they pose is the main point. Defensive layout is next up, every man should have a task. Morton aim to hit the ball into a group of 3 to 4 players, so those players should obviously be the focus of the defence with extra men committed (i’d advise 2 extra players on top of the ones set to man-mark that group). Another thing that is obvious looking at the above – Forbes hits the ball in such a way that it curls beautifully towards the 6 yard area. As an attacker running into that zone you are always going to have an advantage over a defender also running into that zone, knowing that i’m surprised teams don’t drop deeper into their own box – this will allow a much better starting defensive position whilst limiting the amount of run-up for an attacker.